Here’s a way to enjoy Happy Hour in the heat: Turn your favorite fruit cocktail into an adult ice pop. We started with the Margarita, re-interpreting the Strawberry Frozen Margarita as a Strawberry Margarita Ice Pop. You can substitute the fruit and spirits to adapt your favorite cocktail. Prep time: is 15 minutes plus freezing time (overnight). 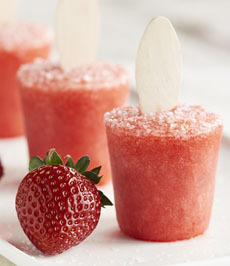 Truly frozen cocktails: Strawberry Margarita Ice Pops. Photo courtesy Driscoll’s. 1. BRING water and sugar to a boil in a medium saucepan. Reduce heat to low and simmer until sugar is dissolved. Cool completely. 2. PURÉE strawberries in a blender or food processor. Strain through a fine mesh sieve to yield 1-1/2 cups purée. 3. COMBINE strawberry purée with sugar syrup, lime juice, tequila and orange liqueur. Pour into ice pop molds. 4. FREEZE for 2 hours, then sprinkle the base of the pops with salt and add the sticks. Let freeze at least 12 hours longer or overnight until frozen solid.